We're proud to honour the outstanding leadership, accomplishments, contributions and achievements of parents, community members, students in Grades 7 to 12 and staff. Each year, we recognize individuals for professional and volunteer services or outstanding achievement or exemplary performance. We also honour teams for their contributions and achieving significant goals through collaboration. Recipients may have different experiences in supporting teaching and learning, but each share a similar set of qualities that exemplify the true spirit of public education—bringing out the very best in and for the people they interact with. On December 4, 2018, the เว็บบอลแจกเครดิตฟรีBoard of Trustees proudly honoured 334 individuals and team members at the 22nd District Recognition event. This year’s recipients bring out the very best in peers, students and the people they work with. Many people volunteer time, talent and energy that not only exceeds our expectations but also sets an example for others to follow. Learn more about the 2017-18 recipients and why they were honoured in this year's District Recognition program. Recognition of Service honours an individual’s outstanding professional and/or volunteer contributions to the life of the school or community. Three recipient categories are recognized each year: parents or community members, secondary students and staff members. Nominations are made based on a number of criteria, such as: quality service, commitment and the relationship of the individual’s activities to schooling and/or the enhancement of public education. Recognition of Teams honours the outstanding contributions or achievements made by groups through collaborative efforts. Three recipient categories are recognized each year: groups of parents or community members, groups of secondary students and groups of staff members. Nominations are made based on a number of criteria, such as: significant contribution, the achievement of excellence through teamwork and the relationship of the group’s activities to schooling and/or the enhancement of public education. Recognition of Merit honours the outstanding achievement of individuals who have demonstrated a standard of excellence in an area of endeavour. Three recipient categories are recognized each year: parents or community members, secondary students and staff members. 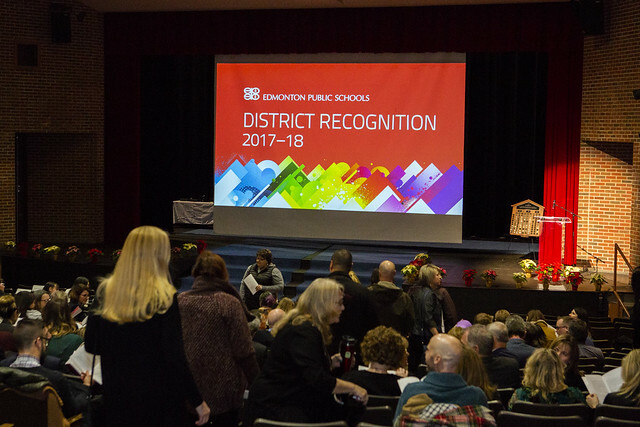 Nominations are made based on a number of criteria, such as: meritorious, innovative, creative or inspiring achievements, leadership and/or endeavours that have brought distinction to the individual, the school, the community and Edmonton Public Schools.